It's no secret that I really like Marcus Borg and his writings. I think that he is one of the best bridge writers from the world of academia to the world of the everyday faith-being. A Scholar who can write in a language that anyone can grasp and not get bogged down in is truly a rare thing! 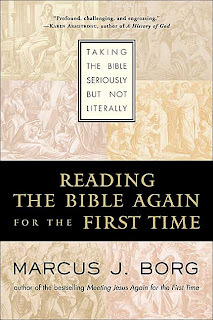 In His Book, Reading the Bible Again For the First Time: Taking The Bible Seriously but not Literally, Borg tries to get the reader to reimagine the Bible, not from a new LIBERAL view (as much people accuse him of), but from a new ANCIENT view. That may not seem to make much sense in wording, but in exploring his book and thoughts it begins to make perfect sense! What he calls a "historical/metaphorical" interpretation (as apposed to the literal (what you see is what you get, and how it's written is EXACTLY what and how it happened) approach), may seem new to us, who are grounded in a modern/scientific/factual mindset, but is a reclamation of how the scriptures (and the oral stories before they were recorded) probably would have been interpreted and taught in their contemporary time periods. This recaptures the mystery and mythology (take that word in it's purest meaning, not out contemporary connotation) that is God and the stories that expressed how the Israelites, Disciples, and early Church experienced the divine! The "historical" part of the interpretation comes from the branch of biblical study called "historical criticism". We cannot completely understand what a passage means until we understand what it meant! understanding the historical context is key to beginning to understanding the scripture. The "metaphorical" portion is understanding the scripture metaphorically over literally. Getting the overall feeling/meaning of the passage. But Borg argues that we can't have one without the other. The scriptures must be understood in both a "historical" and "metaphorical" approach as to balance each other out as well as to help it translate to our lives today! He goes through a survey of the Bible and uses this approach in broad strokes as both examples and explanation. This approach brings FREEDOM back into the scriptures! Instead of the straight-lined literal view, with it's cut and past "cannon within a cannon" (Michael D. Coogan-"The Great Gulf Between Scholars and the Pew" (article)), the historical/metaphorical approach allows ALL the passages and stories to speak, rather than the proof-texting approach of the literalistic tradition. It, more importantly, allows the Holy Spirit the FREEDOM to work in new and exciting ways (which is a paradox since it is actually reuniting it with how it would have worked in the ancient interpretive view) in our lives. Freedom is the name of this book. Once again, the voices of our spiritual relatives can speak freely to us from the past. Their experience of God, limited by their own language and knowledge barriers, can intertwine with our own stories and experiences (limited by OUR own language and knowledge barriers). This is a book I've now read twice, once in undergrad, and even more thoroughly now! It was a blessing of refreshment to revisit this book! I encourage everyone to pick it up and give it a try. It will challenge most people, but challenging doesn't necessarily=bad/wrong. You don't have to agree with Borg on everything, but i encourage everyone to open their mind and at least LISTEN to him. "Truth Wars" declares yoga a battlefield!